The Chanterelle is a well-known and rather common mushroom which grows quite abundantly in woods of spruce and fir, and in wet seasons also in the forests of deciduous trees. Here it may be found growing either in clusters or singly, from June to November. The cap is usually about two to three inches in diameter, but may reach an extreme of five inches ; when young, it is rounded or flat on top, but as it grows older it becomes more or less concave and occasionally folded on itself. The plant as a whole has a uniform yellow color, " suggesting the yolk of an egg," and is smooth. The gills are more like veins than are the parallel knife-like projections hanging like "thin laminated curtains" from the undersides of the caps of many of our more familiar mushrooms. 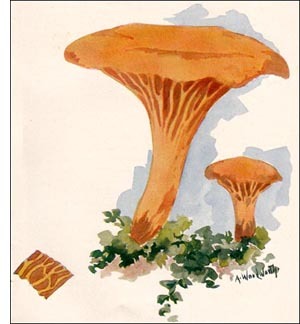 In chantarelles they appear like "turgid veins" rather than gills, for they are irregularly branched and extend downward on the stem in an uneven manner. The stem is solid. The flesh is white and firm and has often afforded an agreeable addition to a camp menu of those who enjoy outings in the coniferous woods of Maine, where it grows in great profusion. The taste of this mushroom when raw is "pungent and peppery," an unpleasant characteristic which disappears when it is cooked. By many, the chantarelle is considered the most delicate and appetizing of all edible fungi.